Bangkok is a big, huge, enormous, gigantic city. It suffers from urban sprawl like no other city on earth, which may make traveling around Bangkok a difficult task, although it doesn’t have to be. 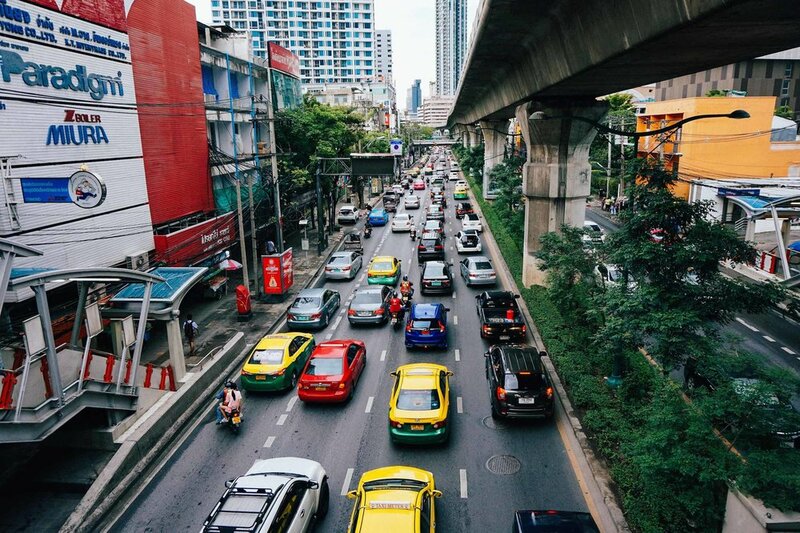 Once you are armed with the correct information and tips, getting around Bangkok could be quite a breeze, so long as you’re not stuck in traffic at mid-afternoon in April or May when temperatures are at their highest. Bangkok has plenty of options for locals, expats and tourists to use to traverse the city and explore all Bangkok has to offer. Some options are more reliable than others. Some options are cheaper than others. Some options are safer than others. And some options are just outright more fun and thrilling than others. Going through all of the choices you can make when deciding how to travel from point A to point B in Bangkok will lead you to rationalize the benefits of all possibilities. But how do you decide on what is the optimal transportation choice in Bangkok? What are the different transportation choices in Bangkok? Bangkok is notorious for having some of the worst traffic in the world. It is estimated that the average commute for Bangkokians is over 2 hours each direction. It is not unheard of to experience moving little more than a kilometer in an hour period during peak traffic times. Luckily, cars and other automobiles are not the only options around. Bangkok has been dubbed, the “Venice of East” due to its many canals that snake through the city and lead to the Chao Phraya River. This water system has led to the wide use among locals of the canal boat services that run daily from early morning to evening. Known as khlong in Thai, canals have long been used by Thai people. The most important khlong for getting around Bangkok is Khlong Saen Saeb. This canal has over 60,000 people riding the boats each day. The canal boats run almost every 20 minutes, and stretch for more than 70 kilometers and has 29 different stops or piers. The canal boat is one of the cheapest ways to travel Bangkok and it has the added benefit of always beating the traffic of the congested city roads. Another water way that is much used is the Chao Phraya River itself. This behemoth of a river has all sorts of cargo and transport ships navigating its waters daily. There are a variety of different water boat taxis that you can discern the differences from the color of the flag they fly. All are less than 50 baht a ride. The river boats run on a similar schedule to the canal boats and finish around 7PM each night. There are also a number of locations along the river that you can catch a river boat to transport you just across to the other side. Most of these are used by tourists to reach attractions like Wat Arun or Bang Krachao ( “The Green Lung” ). An additional way to navigate away from the traffic on Bangkok’s crowded road ways is to utilize one of the four different rail lines in the city. There is the BTS Skytrain system which operates an elevated light rail line that zips you around Bangkok above the traffic of the streets below. The BTS has recently expanded it services by opening up another 8 stations. Currently fares range from 16 baht to 55 baht per ride, although monthly and daily passes are available which make it cheaper for those who expect to ride it more frequently. At the moment, the BTS system has two lines, the Sukhumvit and Silom lines with 43 stations with over 48 kilometers of connected tracks. The other most popular choice for those looking to utilize a reliable and fast transport option is the Bangkok MRT. The MRT is Bangkok’s subway line. It currently has 35 stations across over 40 kilometers of tracks. It is estimated that more than 420,000 passengers ride the MRT daily. In addition to the MRT and BTS, Bangkok also has the Airport Rail Link, or ARL for short. This rail line operates from Phaya Thai Station all the way to Suvarnabhumi Airport in less than 35 minutes for under only 45 baht. The total distance of the ARL is more than 28 kilometers with 8 stations. All three of these modern train systems operate on a similar schedule from 6AM to midnight. The ARL has recently expanded its services to begin operation at 5:30AM. Although these train systems are some of the more reliable ways to travel through Bangkok, delays still occur and it is advised to allow yourself extra time for your travels, especially if catching a flight. The fourth rail system in Bangkok is the outdated State Railway of Thailand train system. This system is more convenient for traveling from Bangkok to other destinations around the country as there are five different lines that connect to most parts of the country. As these trains need to make their way out of Bangkok before traveling further afield to other provinces and cities, there are stops along the way that service parts of the city. It is slow and not advised to use for exploring Bangkok, unless of course you want the experience of the old trains. The final set of options all make their way around Bangkok on the streets. 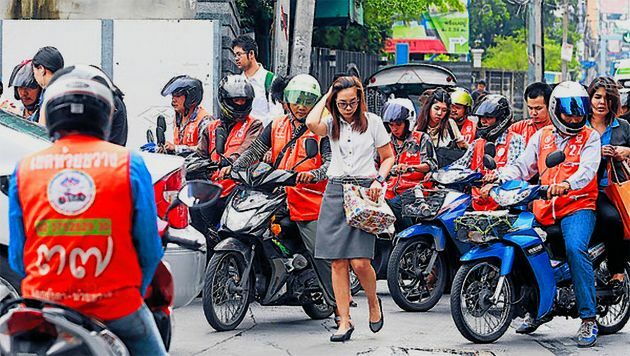 There are motorbike taxis, which are the most thrilling way to explore Bangkok, although the most dangerous, they do serve a specific purpose. Motorbikes are not cheap, but they do zip you to your destination. It is usually best practice to use these for getting from a train station to your final destination. As we have covered two other forms of taxis, the most widely available are metered taxis. No, that is not a joke, there are plentiful amounts of taxi drivers who do have working meters, although it might take some time to flag one who will. Metered taxis start at 35 baht and go up by about 2 baht per kilometer. Stuck in traffic? The meter will keep going up at a rate of about 1.25 baht a minute, which may make a short distance a considerable hit on the wallet. Rounding out our list are the ever noisy, dirty, slow and late buses. Bangkok’s bus system is horribly unreliable. Buses you have waited for over 45 minutes will inevitable show up with three of the same bus numbers behind it. Although they are always late and always not only get stuck in traffic, but are one of the main causes of traffic, they are cheap. Buses can be anywhere from free to a maximum of about 14 baht. Buses come in different colors and they denote the price and type of bus. Some are air conditioned, others are not and windows must be open to be able to breathe in all the toxic fumes of the other vehicles stuck in traffic. How to choose which way to travel in Bangkok? There are several deciding factors that you may take into consideration when selecting the best transport alternative. These may include the price, the heat, the distance, the convenience and ultimately the traffic conditions. No matter what you choose, please be safe and keep a light-hearted disposition and just go with the flow, no matter how slow the flow may be. Bangkok is a great city to explore and traveling in Bangkok doesn’t need to be a hassle or daunting experience.